RIBBON GROSGRAIN CHOCOLATE CHIP 5/8"
1. Print box bottom pattern (in the Pattern Library under Boxes > Define Your Life) on Olive Press Designer Series paper. Cut out, and assemble box. 2. Insert Old Olive cards (3" x 3" size) and envelopes in box. 3. To create belly band, wrap Very Vanilla card stock (11" x 2") around box, and adhere ends together. Adhere Chocolate Chip wide grosgrain ribbon around box. 4. Stamp frame image in Old Olive ink on Very Vanilla card stock (3" x 2"). 5. Stamp saying image in Old Olive ink in frame image. Cut out image. 6. 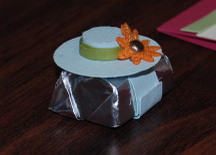 Attach Silver brad to Old Olive felt flower, and adhere to label image using Stampin’ Dimensionals. 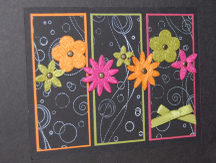 Adhere label to belly band using Stampin’ Dimensionals. I don't think I've told you in previous posts, but over the last 2 weeks my husband Ben, my parents and I have been cleaning out my Gram's barn, shed and pantry. My Gram is 95 and Ben and I live with her. The house has been in the family for many generations and a lot of stuff has been accumulated in that time. Ben's idea was to make the barn into a stamping workshop for me, but we still have a ways to go before that will be ready unfortunately. During the long, arduous process my family and I have had some fun discovering old photos, letters, toys and antiques. I have told my Gram that if she tells me who the people in the photos are (of course most of them do not have any information on them) and where the photo was taken that I will make a scrapbook of the photos and letters to preserve them. I even found my great-grandparents' marriage certificate from 1892. I really feel that these treasures shouldn't be hidden away in dusty old boxes for the rodents and bugs to get at. I'm hoping to get through the boxes and have everything labeled within the next couple weeks. The whole process seems daunting, but I'd love to have a family scrapbook and I think it will be fun. I realize that I'm going to have to place an order to Stampin' Up! soon so that I will have all the supplies I need. Lots of 12x12 cardstock, a few Simply Scrappin' kits, a 12x12 album and a lot of extra pages will be my main priority to start with. Has anyone else scrapbooked black and white or sepia toned photos? Almost all of the photos are not color, so I'm wondering what kind of color scheme I should use to complement the photos. If anyone has any suggestions, I would love to hear them! I also don't really know what I should do for embellishments. I found some really old buttons and eyelets which I kept, but I'm not sure if they would go with the photos. Any suggestions on this would also be greatly appreciated. Tomorrow I start my new job and I'm crossing my fingers that this one is less stressful than the last. I'm also hoping that I can get my Stampin' Up! business going and have more time to actually stamp and scrapbook. We're nearing the end of photos from Spring Fling. Only one more post after this one and then I'll be moving on to some new stuff. Today I'm going to post a couple photos from the Accents and Elements Spring Fling Demonstration. This is just so cute! The best part is that it is pretty simple to make too. It is made up of circle punched paper, a few strips of paper, 2 brads, a flower from the Flower Fusion kit and some adhesive. These would make great party favors for a bridal shower, red hat party, a girls day, a garden party or tea party. I hope to make a few of my own and I'll try to post them once my camera battery is re-charged. I'd also love to see examples of some any of you make, so feel free to send me photos of your creations! I think that this card is just gorgeous. The design is simple and elegant. And I just love this color combination. The flowers and the bow really make it pop. Well, that's all I've got for now. My next post will have photos from the carousel notes demonstration. All content (including text, photographs, and design work) is © Jessica Gale-Tanner. My original artwork is for personal inspiration only and may not be copied for publication or contest submission. 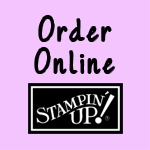 Shelli Gardner - co-founder of Stampin' Up! The Boston Celtics!! 2008 NBA Champions!! The Boston Red Sox!! 2007 World Series Champions! The New England Patriots!! 2007 AFC Champions! Get the 5-Star Rating Widget widget and many other great free widgets at Widgetbox!